I believe in a lot of things. I believe there is a God, I believe there is a greater presence. I believe in connections: historical connections with ancestors before me, and connections with the community that is here now. I believe in cultivating those connections. And those connections offer a lot of really important values and norms that I believe in. I don’t think my belief is rigid, it comes and goes, it develops. So, I guess I also believe that belief in itself is a life journey. The danger is when those beliefs become too set in stone. I believe in fluidity. I think it’s inevitable to say that many of my beliefs are a product of how I was raised. But also, my own soul searching. I think it’s natural to acknowledge that if I was born in a different family, I would probably believe in different things. But the good thing about my parents is that they raised us with values, but also with the freedom to choose those values – to a certain degree, because we all influence each other and I don’t think anyone is truly independent of their parents when they form values. But there was an emphasis on choosing that I was lucky to have growing up. And then there was personal experimentations, trying different things out. For example, I wear a veil. I chose to wear the veil when I was 12. A lot of people ask me, ‘why do you wear a veil?’ but I think a more appropriate question is, ‘why do you still wear it?’ The reasons why I choose to wear it has changed over time. When I was 12, the most important thing in my life was which Junior High School I would go to. In Islam, there is something called nazar, where you make a pact and if God fulfils your wish you have to redeem the pact. So, my pact was, if I get into the school I want, I’ll wear a veil. I mean, I was a very shallow kid! So, I got into the school, and initially I only wore it to school. My older sister wasn’t wearing a veil, and it was my pact, so no one forced me to wear it. I had some classes late afternoon, so I would be going home pretty late, after dusk. Somehow, I felt quite at peace walking by myself, and I attribute it to my wearing a veil, because I felt more comfortable in my body. I think that made me feel more solid with the decision, and I started to wear it full time. Then, four years ago, I started doing my Master’s here [in The Netherlands]. I’ve always liked solo backpacking, but I’d only done it in Asia, never in Europe. Doing that Master’s made me rethink a lot of my beliefs and values. So, I decided that summer to do a solo backpacking trip in Europe and I’m gonna take my veil off during the trip. At first, my experience was that it was very refreshing. It was the first time in over a decade that I went out without wearing a veil so it was shocking to my whole nerve system, haha, and I enjoyed it. But by the time I got to the second week, I also felt like, when I was meeting other people, that I wasn’t introducing myself as who I really was. I felt fraudulent in a way. So, by the time I got to Poland I decided I felt more at ease with my body when I have it on. Maybe because I was so used to wearing a veil, and the novelty of not using it had worn off by that time. Also it’s very troublesome, your hair gets all over the place – I guess I never had to take care of my hair haha! So, I went back to wearing the veil and until now I feel comfortable with that decision. So that’s what I mean – it’s very much a fluid process. People talk about religion as if you take one decision and you’re stuck with it for life, but I don’t think that’s always the case. I do quite proudly identify as a Muslim. A lot of religion is a matter of institution and association, but the way I was raised into Islam was not to see it as a very hierarchical institution. Some people follow a particular religious leader; I follow Islam as best I can, but not a particular leadership. My belief is something very personal to me. There is so much politicization of Islam, that makes it seem very exclusive in the way that it’s practiced by a lot of people. There is so much focus on what we’re not allowed to do. I don’t define my Muslimness by fear or by things that are forbidden. I have Muslims friends who don’t consider me a very good Muslim, but I also have liberal friends, who consider me too conservative to be a liberal, so I’m kind of in-between. Personally, I don’t think my lifestyle inherently contradicts my religion because there is so much important philosophy and values in the religion that I follow. That, I think is more important than the rituals of what we’re allowed or not allowed to do. But I understand that there are mainstream practices, and I kind of go in-between and change every now and then. For instance, alcohol. I grew up not drinking alcohol, but in general I think the more important principle is not to get drunk or loosing control. So, every now and then I can enjoy a glass of wine and I don’t think it contradicts my beliefs. But there was a phase where I had to rethink why I was drinking the wine. Because especially in Europe I was drinking just to make the social interaction easier, and I didn’t like that part of me. So that needed some reflection and I think religion then offers a structure of life… I mean, freedom is supposed to bring you happiness, but it’s not necessarily the case for me. I like having some limits, some structure, it makes me feel safer. So, it’s a bit of both: for the sake of taste, for my own enjoyment, a glass of wine is fine, but not too much, and not doing it out of peer pressure – that’s where religion comes in. 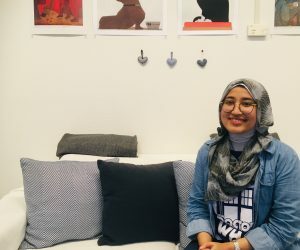 I come from an Islamic majority country, Indonesia, and what I found interesting being in The Hague, interacting with other Muslim friends from other countries, I realised how different Islam is often practiced, and that there are different emphasis in how people are raised into the religion. An example, during my MA I went to a Sufi gathering in Germany; my first experience of a Sufi gathering. And I was very intrigued by a lot of things. But one of the funny moments was, in Indonesia and Malaysia we have something called a mukena, which is a two-piece or one- piece clothing that completely covers you when you pray. So, I wanted to put mine on, but I realised that no one in the room wore one. Even the girl next to me, who was wearing a veil with just jeans. In Indonesia you wouldn’t pray like that. It’s not about what is better or worse, it’s just funny how we often don’t realise the diversity within our own Muslim community. Meanwhile in ‘The West’, Muslim women are often stereotyped as oppressed or lacking agency. And I remember being at an Interfaith Conference here in The Hague, and someone made the comment that in Islam, women are seen as only half of men. And I said, ‘I’m a woman, and I can tell you, I’m just as equal as any man in this room’. And I think, speaking up for myself, and being vocal about my beliefs often surprises people.